"Rainbows" WebApp Courtesy of the Cooperative Institute for Meteorological Satellite Studies (CIMSS), Copyright (c) 2013 by Tom Whittaker at the University of Wisconsin-Madison. When the conditions are just right, a rainbow will appear in the sky. It happens because the sunlight shines on water droplets. As the light passes into the droplets, the light bends, or refracts, a little, because light travels slower in water than in air (because water is denser). Then the light bounces off the back of the water droplets and goes back the way it came, bending again as it speeds up when it exits the water droplet. 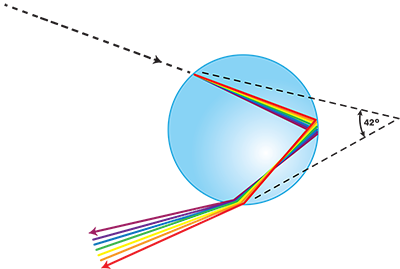 This bending splits the light into the different colors like a prism, and we see a rainbow in the sky. In this rainbow simulator, you can make all kinds of adjustments to see how angles and distances affect the rainbow you can see. You can move the sun in the sky by clicking and dragging. You can also move the person back and forth to see how the distance changes the view of the rainbow. Check the primary button to see the primary rainbow. Primary rainbows have the red band on top. This is the main rainbow people usually mention, but depending on your perspective, you can also see a secondary rainbow. Check the secondary button to see the secondary rainbow. The secondary rainbow has the red band on the bottom, so it's a mirror image of the primary rainbow. They're caused by the double reflection of sunlight inside raindrops. The secondary is seen in the sky above the primary rainbow and is fainter than the primary rainbow because some of the light is lost as it gets reflected each time. Raindrops refract and reflect sunlight to split it into the beautiful colors of the rainbow. Rain Curtain mode shows two parallel light rays from the sun refracting off a raindrop at the both the top and bottom of the rain curtain. Single drop mode shows the path inside a single drop. You can see exactly how the light enters the raindrop, is reflected off the back, and bounces back out again. Remember, as it passes through the raindrop it gets refracted, where the path of the path of the light is bent. Multi-drop mode shows three parallel light rays refracting off three raindrops at different altitudes. In this mode, you can drag the drops up and down as well. Try these different modes and look at the primary and secondary rainbows for each.